We have ourselves a title screen! Finished mid-week, this was Flora’s final image for me and is about the grandest sendoff I could ask for. =) It’s even thematically appropriate! …but this artwork was always destined to use this concept. 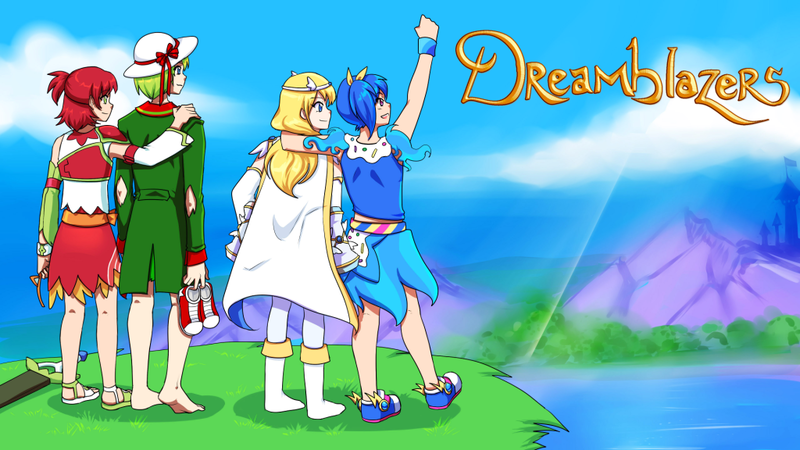 Besides the obvious adventure theme, Leaf, Celty, Cotelle, and Minori are who I call the “Big Four” of Dreamblazers, the mainest of main characters—I wanted to emphasize from the very title screen that there’s no “Goku” who dominates the spotlight. There’s another subtle bit here with the character groupings. In a game about people’s hopes and dreams for the future (and I’m not talking about the story only or even the story primarily; the most important thing to me is that the gameplay is about the player‘s style), characters are bound to have different dreams. Leaf and Celty are united here, as are Cotelle and Minori, but the two pairs don’t share the same vision for what they want to bring to their world, so there’s a slight physical gap between them. I actually do know what a story is—but I found that I knew what pixel art was until I sat down to explain in detail what I wanted. It ate a good lot of time to hunt down references and think through how much is too much or how little is too little. Do I want three frames of animation for water or do I want five? How many types of edges do I need for sand? What small details would give the ground visual variety? Should I go for complete-looking tile sets now so that I can make a more earnest attempt at raising money from other people? On the flip side, given that I don’t know if I’ll be able to raise money or how much, should I do more minimal tile sets now? In the end, the answer is often “I don’t know, so I’ll just play it by ear.” I refuse to say “this is more art than science,” partially because I don’t care whether video games are art and mostly because I don’t believe there’s any legitimate divide between art and science in the first place, but the idea does stand that there might be no right answer in terms of how to handle pixel art. Either way, the point is that pixel art is just about underway and I couldn’t be happier with that. ♥ The long run of character design art has concluded, but we’re making like Pokémon: hitting Baton Pass and pursuing another horizon. This entry was posted in Devlogs, Dreamblazers and tagged Pokémon on January 26, 2015 by JellyPaladin. The long and short of this past week is that the pixel artist search is underway. I have Becca for environments, but I still haven’t found someone for characters (monsters included). Ideally I want to find someone who specializes in characters; I purposely look for specialists. Becca says she likes drawing environments, so that’s what I want her for. With the character designs, I asked Flora if she enjoyed those or enjoyed other types of art more; since she said she likes designs, that’s what I had her do. I always look to help people do things that they’re good at and that they enjoy. I want to continue to uphold that standard, but I don’t know if I can. Because pixel art is such a specific medium, pixel artists are pretty rare, good ones are even more rare, good ones who draw in styles that I prefer are still more rare than that, and and good ones who draw in the style that I prefer and also aren’t backlogged from being heavily in demand are still more rare than that. This isn’t like promotional art where tens of thousands of artists for any conceivable style are available at any given moment, so even amazing ones are posting “looking for work” notices. Hopefully I’ll find someone soon. As always, work progresses on the Unity side as well, but now it’s at the grind point instead of the regular-massive-breakthroughs point, which is why I’ve dropped the old devlog format. This entry was posted in All Text, Devlogs, Dreamblazers on January 19, 2015 by JellyPaladin. * I went back to the basics and watched many Unity tutorials—something I should have done months ago, frankly—and picked up multiple new ideas for handling things more effectively. * Because I went back to the basics, the camera works now! * The collisions work better than they did before (and I figured this one out myself). Because my placeholder sprite was larger than the other sprites around it (in the vein that Final Fantasy VI‘s sprites are slightly taller than a tile), my character was occasionally being pushed around to coordinates like 15, 12.034 instead of even integers. Got that taken care of. * And, totally unrelated to Dreamblazers, after three months of SolForge ladder tournaments I finally won one! So two core parts of the game are now functional: RPG gameplay mechanics (battle system, stats system, etc.) and most of the 2D physics. However, so far I built each component in a vacuum: the RPG gameplay operates in a 3D setting and the 2D physics operate without any of the RPG elements. Now I need to put them together and hope nothing breaks. I’ll also be concurrently searching for pixel artists. In July 2014 I told myself that I aimed for a playable demo within a year. So far I can’t tell if I’m going to make that goal or not, but in order to have any chance, the pixel art ball has to get rolling immediately. Environments, characters, menus: the whole works. This entry was posted in All Text, Devlogs, Dreamblazers and tagged Final Fantasy on January 12, 2015 by JellyPaladin. Aside from that, my issues with getting the camera to follow the character have been making me feel inept. With collision detection, I knew I wasn’t alone since searches turned up hundreds of people with the same issues, but it seems that nobody has trouble making a camera follow correctly in Unity. Of course, most people making 3D games could use Unity’s default camera; even I can get that to work, but it doesn’t handle 2D well and keeps zooming in and out on the Z plane. What baffles me more is that nobody has issues with 2D Toolkit’s camera; either they’re all great or I’m missing the obvious. Back to tinkering it is! This entry was posted in All Text, Devlogs, Dreamblazers on January 5, 2015 by JellyPaladin.